We resume our Violin Tournament today, with the Sibelius Violin Concerto vs. Prokofiev Violin Concerto No. 1! Yes it's a vote, but please also look at it as a chance to measure your thoughts, talk about your favorite recordings, share experiences, historical info, and whatever else you'd like to add in relation to these concertos. Premiered in 1923, the concerto begins with a dreamy first movement, moves to a wickedly wild "Scherzo" second movement (fast, not slow!) then a third movement that's kind of all over the place, with moments intimate and very outward, big and small, meandering in places and directed in others. 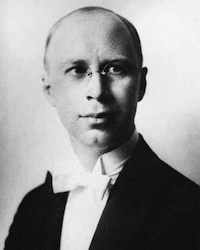 It has that signature eloquence mixed with abandon that musicians tend to love in Prokofiev. Here is violinist Hilary Hahn, performing with conductor Lorin Maazel and the Bavarian Radio Symphony Orchestra. 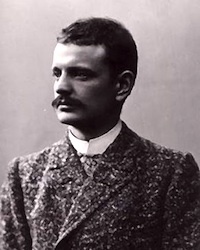 Jean Sibelius completed his violin concerto in 1904, apparently in an alcoholic fog. He was a late-starting violinist himself (having taken it up at age 14), and his love for the violin was deep: he aspired -- and failed -- to become a great violinist. Nevertheless he wrote one of the best violin concertos we have. In fact, the violin concerto was the only "concerto" he wrote for any instrument. It's like no other violin concerto; what piece of music depicts the beauty of an icy landscape better than the opening of the Sibelius VC? Part 2: Movement 1, continued, cadenza. Evan, what a great recording, what vibrato! I do like the Prokofiev #1, but had to go with Sibelius. If its was Prokofiev #2 vs. Sibelius I would have been in a state of existential uncertainty from which there would have been no escape. Two fine concertos. Hard pick. I am with Wayne though. If it had been Prokofiev No. 2 I may have dropped Sibelius. This was too hard but I had to go with Sibelius, as m5ost people, as it seems. Must be Sibelius. I must remark that my favourite version is Chee-Yun. Does anyone know where I can find a recording of Chee-Yun playing the Sibelius? I don't mean to be rude but if Sibelius lost I think I'd have lost all faith in humanity. I love Sibelius but I voted for Prokofiev 1. I enjoyed studying it more. I enjoyed studying the Sibelius more, but that was back before I got my del Gesu. @Joshua if you type "chee-yun sibelius" into YouTube you will get some videos to watch. Definitely the Sibelius. And yay! You posted a video of Lisa Batiashvili! In my opinion she and Benjamin Beilman play the Sibelius the best. I guess I'm one of the few to go with Prokofiev. Oh well, the Sibelius was great too. Although really Malik?... "all faith in humanity"